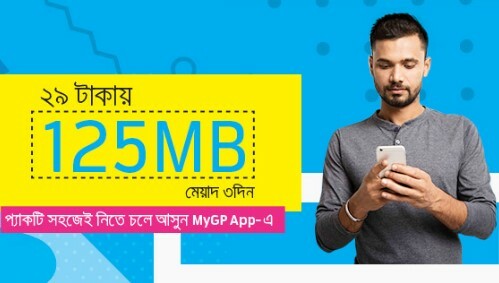 Grameenphone all prepaid and postpaid customers are eligible to enjoy special GP 125MB Internet 29Tk Offer. Now all customers can enjoy GP 125MB internet with a special validity for all users. GP all time provide for their valuable subscribers to enjoy many minute offer or internet offer for lower price to other operators. GP internet is the most famous for their strongly network service. 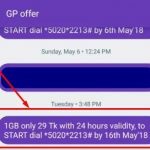 So the customers who want to activate GP 125MB Offer with 3 days validity. No tension, here I will share all details about thus special internet offer for all GP subscribers. 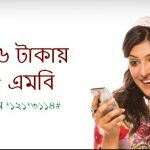 GP all prepaid and postpaid customers can eligible to 125MB Internet Offer. To activate 125MB 29Tk offer, customers need to dial USSD Code *121*3074#. Customers will be charged Tk29 with need (VAT+SD+SC). GP 125MB Internet offer is validity in 3 days for any uses. Customers will use this data in 24 hours. To check your internet balance, just simply dial *121*1*4#. Customer can activate unlimited time during this offer period. After Internet Volume Expiration customers will be charged Tk .01/10KB (till validity exists, up to 244 Taka). This Offer will run after the future notice. Customers also can stop this internet package very easily. To stop your internet package, customers need to dial *121*3041#. We also recommend you to all details about the GP Surprise Offer . We hope you can get a clear solution about the GP 125MB Internet 29Tk Offer details. To know more or face any problem to activate this offer, please comment the box. We will try best to solve your problem.